Remember to listen. Remember to love. It was probably about 30 degrees or colder outside as I was driving to Burton two Sundays ago. I got off at the exit like I have done many times in the past and just like many other times there was someone standing on the corner with a sign. I usually don’t carry cash and sometimes when I do I have excuses like “The light will turn green at any moment” or “I’m too far away from them.” Sometimes I’m not even phased by seeing them there. I’m sad to admit that that’s how I think sometimes. But this time was different. I remembered I had cash on me. It was only $6, but it was something I thought to myself. The man holding the handmade, cardboard sign was probably in his 60s I guessed. He had round glasses with thick lenses. He looked cold. He must have felt cold. 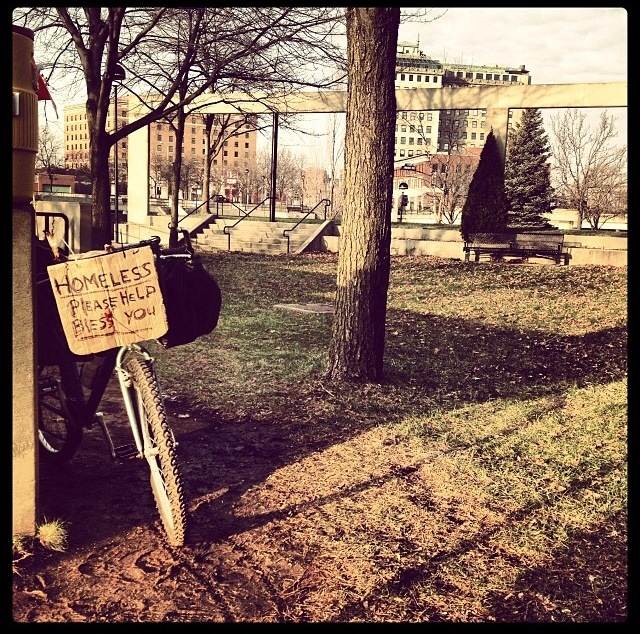 Image was taken in downtown Flint in November. You could tell he was thankful … for $6. He seemed kind and lost. As the light turned green I wished I could have had more time with him. My heart broke for him, not knowing where he would go that night or if he had family to go to. I’m sure he had a story. I, unfortunately, did not get a chance to hear it. So I am not writing this to tell you his story, his struggles, his passions, his hope for the future. I am writing it as a reminder that life is not about rushing around and getting from point A to point B. Even a smile, some spare change, a moment of your time can change someone else’s day, as well as your own. I thought about that man all day and still think about him. I wish I could have heard his story, gotten to know his heart. Don’t take opportunities for granted. You don’t know where it will take you or what you will learn. I had someone ask me what I thought he did with that money. You know, I have no idea. But really, it doesn’t matter to me. We are called to love. End of story. I challenge you to go out today, tomorrow and the next day and simply make an effort to show kindness to someone who might normally show it to. Ask someone how their day is. Share a meal. Donate your time, resources or skills. Love. Listen. Check out some of the other stories from the Flint Stories Project.